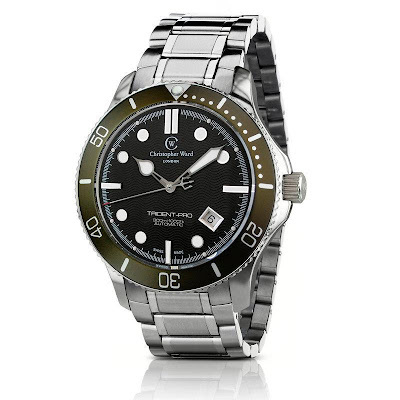 In August we reported on the new colourways available for the Christopher Ward C60 Trident Pro. Now, just a little over two weeks later, we are delighted to show you the watch hands on. Ernie Romers has thoroughly test driven the watch for you to judge how good it looks, and he’s so happy with it we might have a problem in getting it back off him! Having worn the watch for a couple of days, Ernie reports that he loves the hour hands and especially the clever second hand with the trident design. Talking of design and exciting new colourways, Ernie’s shirt is a design classic all of its own! Thanks to an excellent strap, available in rubber or as a steel bracelet, the watch fits comfortably on the wrist and is comfortable to wear throughout the day. Ernie proclaims it as more than a mere Rolex homage, it has a style all of its own. His only niggle was the crown which he felt is rather on the small side. Of course one of the key selling points of a Christopher Ward watch is the superb quality versus cost ratio. With the C60 Trident Pro you’re getting a quality Swiss-made watch inspired by the legendary 1954 Rolex GMT Master and yet the asking price is just US$676. The Trident Pro is powered by the ETA 2824 -2 Sellita SW200-1 movement and is water resistant to 300m. Just click on the pictures to view them in high res.